It is now over three years since my petition for a Sunshine Act for Scotland was closed. Over this time I have on occasion requested an update from the Scottish Government on actions taken. The Scottish Government informed me on each occasion that it was “scoping options”. In search of further clarification I requested (through Freedom of Information legislation) any Scottish Government correspondence regarding this subject. The response, some of which is reproduced below, did indeed provide further clarification on Scottish Government actions since my petition was closed. 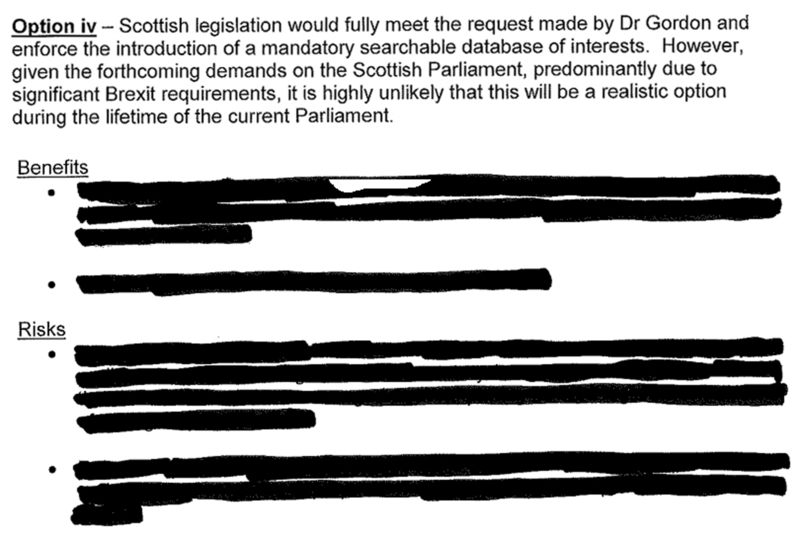 As is often the case with FOI responses some of the material has been redacted. 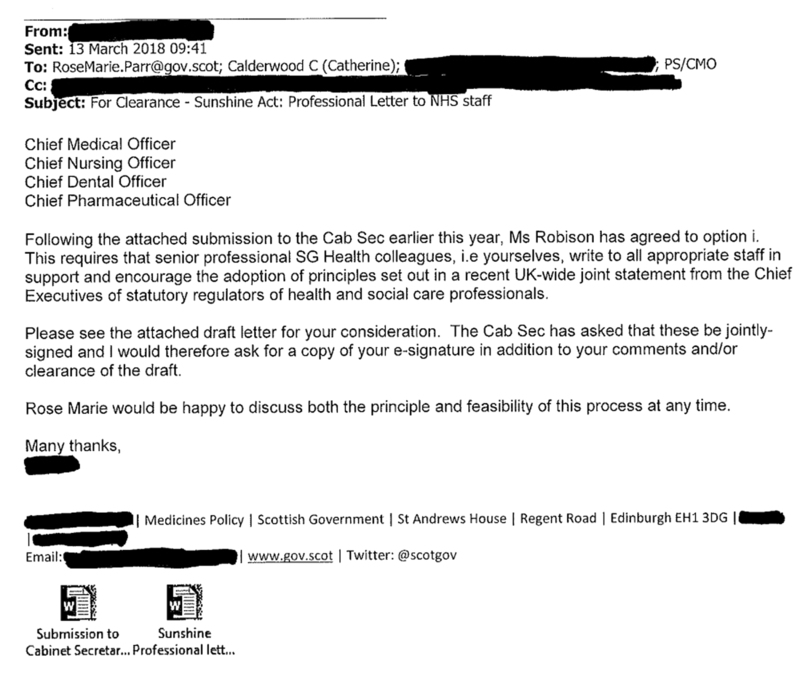 It was interesting to note that a considerable amount of the correspondence included the Counter Fraud Service of NHS National Services Scotland. I was also encouraged to learn that the Scottish Medicines Consortium (SMC) was broadly in support of the principles behind my petition. 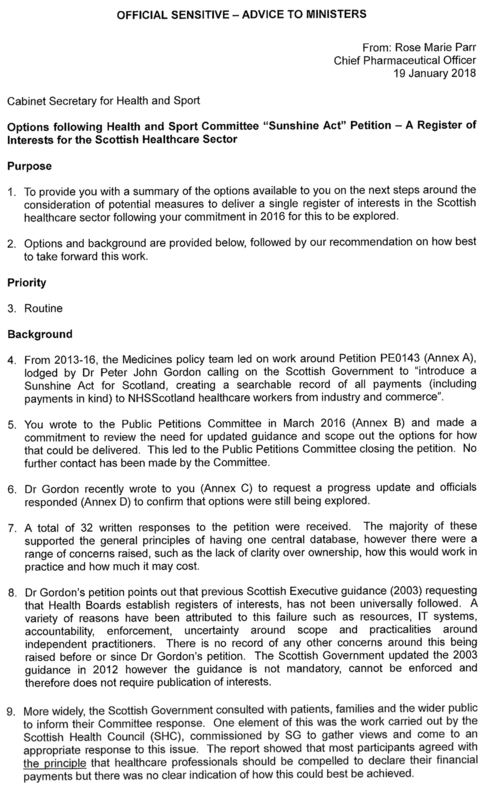 I have included below the summary report to the Cabinet Secretary for Health and Sport from Scotland’s Chief Pharmaceutical Officer. Until now, even as the original petitioner, I was not aware of this report. In this report you will note that four options were presented to the Cabinet Secretary for Health and Sport with Option One being “recommended”. This was indeed the option that the Cabinet Secretary chose (see the final document below). 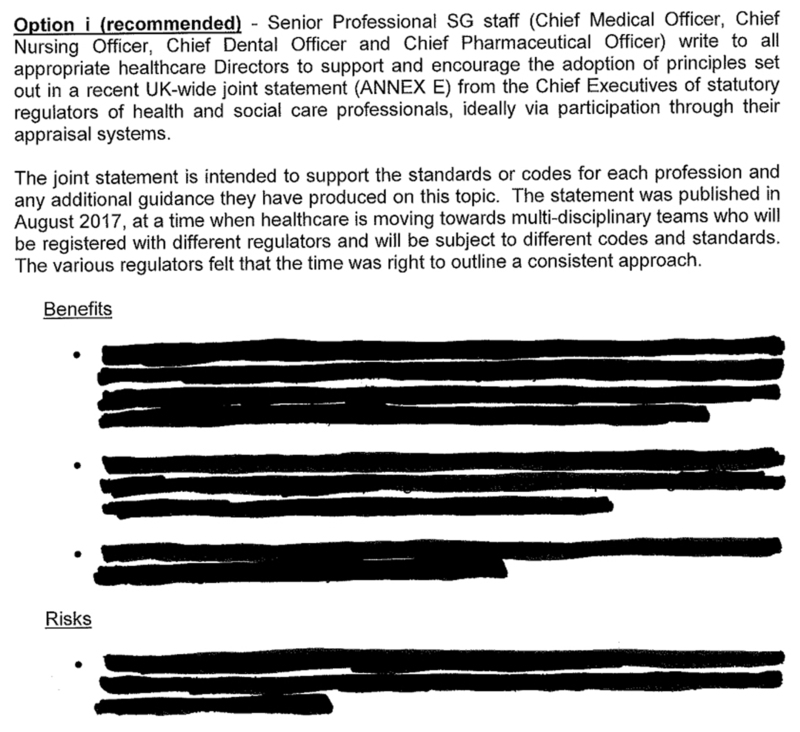 It is interesting to note that the risks and benefits of each option have been redacted completely. The closest option to that proposed in my petition was Option Four. The Report stated that this was “highly unlikely to be a realistic option” mainly because Scottish Parliament time is being devoted to Brexit. 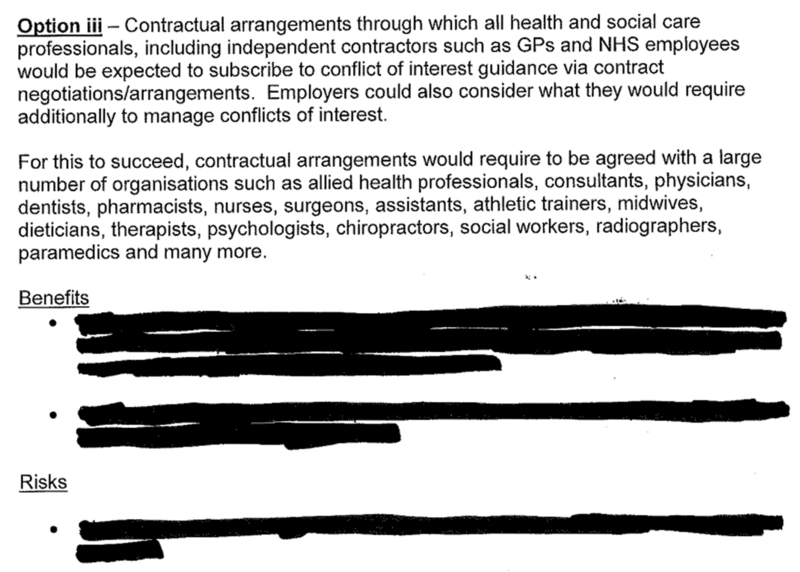 Point 8 of this report states that “there is no record of any other concerns around this”. 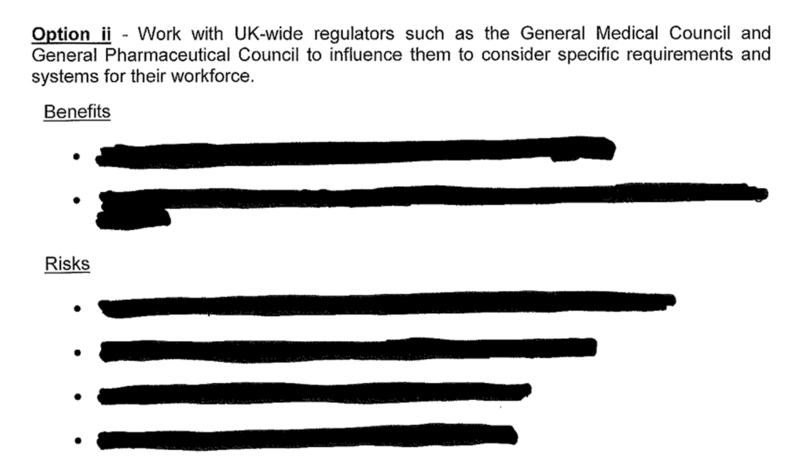 Since this Report of January 2018 the Britton Inquiry into the Independent Review on Mesh implants concluded that transparency of competing interests was essential. Given this conclusion it is incumbent upon the Scottish Government, in order to minimise the potential for future patient harm, to revisit this when parliamentary time becomes available. The Scottish Parliament is rightly proud of its public petition system which allows open consideration of matters of concern to individuals living in Scotland. It was affirming to me as petitioner that the official public consultation supported a mandatory requirement for all competing financial interests to be declared in an open register. It is a matter of concern that it has taken a Freedom of Information request for me to find out any of the details provided in the documents below. I support the Scottish Government’s ambition to be as open as possible and to support Realistic Medicine but I find myself repeatedly disappointed because its actions fail to match that ambition.